^ Howard Schultz (1999-01-06) (英語). Pour Your Heart Into It: How Starbucks Built a Company One Cup at a Time. Hyperion. ASIN 0786883561. ISBN 978-0786883561. 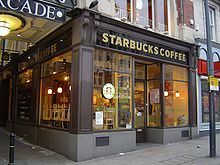 ^ IWW Starbucks Workers Union Archived 2004年12月17日, at the Wayback Machine.